MSA has improved the Advantage 200 respirator even further. The result is the highperformance, economic and easy to handle Advantage 200 LS respirator. 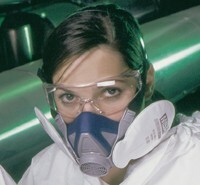 Working with production materials and handling chemical products requires the use of respiratory protective equipment. For this reason optimal respiratory protection for the many different hazardous substances is essential. This applies to emergency situations as well as to precautionary measures at workor in situations where healthendangering gases or substances are released. The "feel good factor"is also essential. If your mask does not fit exactly, not only the quality of your work suffers, but safety is also endangered. MSA makes a mask that surpasses all previous comfort criteria. Our Advantage 200 LS with its filter technology meets every requirement of modern respiratory protection. The respirator is extremely safe, exceptionally comfortable and incorporates the latest technology. Furthermore, it is characterised by light weight,minimum breathing resistance and uncomplicated handling. Especially the modified nose area and amply dimensioned chin and cheek sections ensure a comfortable and pressure-free fit. [Universal: The Applications] - The Advantage 200 LS protects against dirt, dust and hazardous gases. The mask is suitable for every area of use, whether in industry, craft trades or DIY.With its excellent facepiece-to-face fit, it provides maximum protection and offers greatly improved wearing comfort. [Flexible: The Use] - The Advantage 200 LS consists of the face section, a 4-point yoke, the inhalation and exhalation valve and the head harness. In addition, it is fitted with various particle, gas and combined filters. [Comfortable: The Fit] - MSA's engineers have developed the unique facepiece-to-face Anthrocurve, which fits the user's face contours without any problem. This means even greater safety plus a faultless fit. The respirator is available in three different sizes. [Optimised: The Design] - As a result of continual product improvement, the Advantage 200 LS is extremely comfortable thanks to its flexibility, light weight and 4-point harness. The ingenious Multiflex system is unique in the market. The plastic components are embedded in a soft material, thus making the face section elastic and robust. For storage and transport of the mask, the Advantage belt pouch provides a perfect solution.